Of interest to listeners in the Minneapolis / St. Paul area: I have scheduled some house concerts for next week. I’ll be playing some Chopin and original work not yet heard on In the Hands! Dates, more info, and reservations here. Exciting! New! Read all about it! For those of you not up on all the tech-y stuff, this site has a “podcast” — a feature that lets your computer automatically download the music and save it to your music library or portable music player. Until now, the podcast has featured a spoken version of the written commentary that goes with each piece. This works well for people listening, say, at the gym or in their car. However, while you might want to listen to the music over and over, I really doubt you want to hear my introductions all that often. (My voice is just not that exciting.) Because the podcast always included the commentary, people who wanted just the music still had to manually download each track. Aaron wisely suggested that I do a music-only podcast as well. It’s a great idea, and I finally got around to doing it. If you are listening on the go, and want a radio-show-like format with spoken commentary, subscribe to the podcast with commentary. If you want to automatically download just the music to add it to your listening library, subscribe to the music-only podcast. And heck, if you want the spoken commentary for the first listen and the music for future listening, well, subscribe to both! I finally updated my description of how I make my recordings to reflect all of the work I did last year to improve the mastering process. Although I made revisions throughout that whole area of the site, the bulk of the new information is in the section on mastering. This is primarily of interest to others making their own recordings, but may also be of idle interest to anyone who is curious what goes into producing the finished product you hear. Sorry for the long hiatus. It’s been a busy time: my latest sabbatical is running to its end, I’m broke, and back to job hunting. So I’ve been having to put aside the music and be all practical lately. The trick is, I don’t want a tune that’s so catchy it interferes with the music I’m about to play; my opening music needs to have a sort of palate-cleansing effect. I decided the thing to do was to make a collage of several different pieces, to get you in that piano mood without a piano tune in your head. Here’s the what I came up with. This new audio logo won’t make much difference to those of you reading the text version, but for those listening to the podcast, here’s how it sounds as part of an episode. The latest episode of the always-excellent Bowed Radio features a movement of The Broken Mirror of Memory. The whole episode is quite wonderful, well worth hearing (listen) — and the great sound of the other selections really makes me wish I had a higher-quality recording of Diana’s nice work on Mirror! Adrian graciously describes In the Hands as a “must-listen” for piano lovers, and gets big bonus points for pronouncing my last name right. Uwe Hermann’s podcast featured one of my Chopin étude recordings. I was especially pleased that he didn’t shy away from including a classical piece — it drives me crazy how there’s this weird wall between classical music and the rest of the musical world, a wall which a lot of people on both sides work awfully hard to keep in place. I have a dream that one day my music will live in a world where it’s judged not by its categorization or its genre, but by the content of its character. Kyle Gann tells me he’s added In a Perfectly Wounded Sky and Three Places to the playlist over at PostClassic Radio, which plays a fine selection of “weirdly beautiful new music.” The show seems mostly oriented to the credentialed circles, so I was very pleased with Kyle’s graciousness in including a small-timer. And finally, Netherlands-based Robkast featured last week’s Brahms Intermezzo. I don’t speak Dutch, so I have no idea what Mr. Rob of Robkast is saying (listen) — but careful listening suggests that he may be announcing the name of the piece. Since In the Hands was featured in Adam Curry’s Podfinder (Thanks Adam! ), a lot of people have been asking how to subscribe to this podcast in iTunes. Please note: This is not the support web site for iTunes. These are instructions on how to subscribe to this podcast. That’s it. For general help with iTunes, please contact Apple. General questions about iTunes posted here will be deleted. Click this link to open In the Hands in iTunes. On this subject, I have a favor to ask of In the Hands listeners. 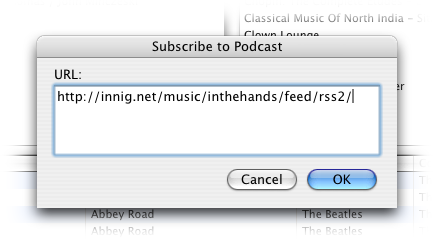 The reason people are having trouble subscribing is that Apple hasn’t included In the Hands in their podcast directory. It’s been submitted, but hasn’t shown up yet. Their support department has been completely useless — they just sent a form letter saying that submitted podcasts show up within two weeks (it hasn’t), and didn’t respond to my second inquiry. So, I’m kind of stuck, but you can help: go to the iTunes request page, and request that iTunes include the “In the Hands” podcast. Maybe if they get some requests from several different people, they’ll start paying attention. Update [2005/09/26]: I’ve finally shown up in the directory, though I’m still not appearing under the “music” category. After over a month of waiting, I finally filed this as a bug report on Friday (as Michael suggested below) — and by Monday morning it was in the directory. Methinks Apple is not running a very tight ship with this whole podcast directory thing. Sort of unusual for them — they usually do really fine work and are on the ball. Update [2005/09/27]: ItH has vanished from the iTunes directory this morning. However, iTunes support did finally send a response to my latest inquiry: it seems to consist of all of their canned responses for podcasters pasted one after another in a single long email. It it hilarious. It now looks as if their support department is not actually staffed by humans at all, but by a bot — and a rather stupid bot at that. I wonder if it’s reasonable to submit “iTunes support department fails Turing Test” as a bug?